CASCO BAY, Maine - Kelp noodles are exactly what they sound like: seaweed in long, green strips cut to the rough dimensions of linguine. "Ingredients: Kelp," reads the package. "It's very versatile," says Tollef Olson, CEO of Ocean Approved, the Portland, Maine, company behind this anti-pasta. "Instead of a vegetable, you can use kelp. Instead of a noodle, you can use a kelp noodle." Packages come pre-cooked and frozen. Thawed, the strips have a satisfying firmness, a mild flavor not unlike green beans and, not surprisingly, the faint, salty aroma of the ocean. 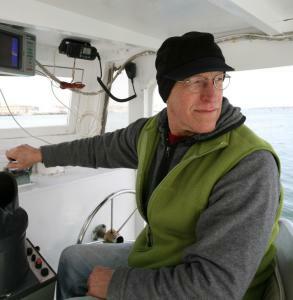 "The seaweed industry in the United States doesn't really exist yet," Olson tells me as we motor past the Portland waterfront and out into Casco Bay. It's chilly, and Olson has just lit a fire in the boat's tiny wood stove below deck. "We're really just making it up as we go along," he says. So far, that has entailed the fledgling company's chief executive slipping over the side of a boat several times each week to harvest the stuff. In a few minutes he'll change into a 7-millimeter-thick wetsuit to keep him alive in these frigid waters. So far, Ocean Approved seaweed is available in two local specialty shops and Portland's Whole Foods Market. The company is in talks with Hannaford to expand distribution further but because the kelp is gathered by hand, keeping even these few outlets stocked is becoming a problem. More freezer space will increase capacity in the short term, but Olson is really counting on ramping up an aquaculture installation here over the next year to bring capacity up and costs down. For now, the chief executive emerges from below deck with a snorkel and a linoleum knife and puts on his flippers. It's about an hour before low tide, and employee Bernie Sutherland drops anchor 40 feet off of a rocky outcropping guarded by a few dozen lazy seals. "I'll be lucky to last an hour today," Olson says, stepping into the small skiff we've been towing. The boat's radar display says the water temperature is 38.9 degrees. Sutherland starts the skiff's outboard and ferries his boss to the shallow kelp beds, now just three or four feet beneath the surface, while Olson's partner, Paul Dobbins, arranges three big marine coolers on deck and sets out a long, wide, wooden board to work on. Olson rolls out of the skiff and into the frigid water. Sugar kelp is what he's after. It grows in long, wide, leathery fronds anchored to the rocky bottom. Here, they reach lengths of six feet or more, and Olson, his hands guarded by three-fingered neoprene mittens, slices off the last yard or so of the choicest specimens with his hook-bladed knife. "You know it when you see it," he tells me later. He stuffs the kelp into a mesh bag, suspended beside him underwater by a buoy. As each bag fills, Sutherland shuttles it over to Dobbins, who lays each piece of kelp on the board and slices off the frilly sides. The remaining center portion, which resembles a 3-foot length of brownish-green lasagna, is tossed into a cooler where, later, it will be cooked, cut, portioned into bags, and frozen. Olson returns after 45 minutes, his face white from the cold. It's a good haul - he's bagged just about enough kelp to break even on this trip - and he slips below to warm up by the stove, stoking the fire, and setting a few fingers of seawater to boil. He's brought along some mussels to steam and eat over a package of kelp noodles on the way home. Sutherland hauls anchor and fires the engine. We cruise back toward Portland, and Olson serves the rope-grown mollusks (another of his ventures out here in the bay) over the kelp, handing out paper plates as we weave through the inner islands. Like pasta noodles, kelp is a submissive plate-mate, wrapping neatly around the tender mussels on a fork and bending nicely to their sweet, meaty flavor. Hot, simple food has a tendency to make you smile after a few hours on a cold ocean, and we slip into port a happy crew. The ocean provides - noodles and all. Ocean Approved kelp is available at Harbor Fish Market, 9 Custom House Wharf, Portland, Maine, 800-370-1790 ($3.25 for 4 ounces); Browne Trading Co., 260 Commercial St., Portland, Maine, 800-944-7848 ($5 for 4 ounces), and Whole Foods Market, 2 Somerset St., Portland, Maine, 207-774-7711 ($4.69 for 4 ounces).